I am an artist who specialises in creating large scale commission-based artworks and I absolutely love it. It can be overwhelming knowing where to start if you would like a custom created artwork. 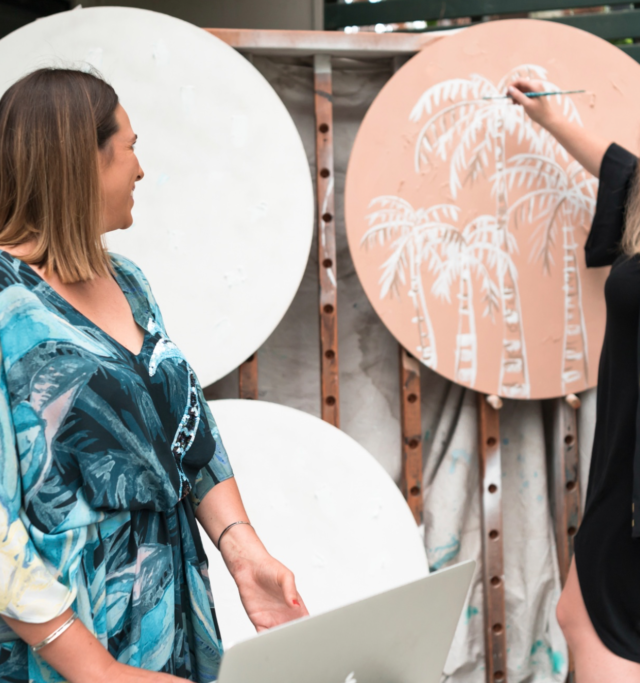 It is a pretty easy process and the same kind of questions arise with varying clients, so here is a bit of a rundown on commissioning artwork and some steps to help you adorn your walls with a creative piece you will love! Firstly, pick an artist you love! The artwork will be something you look at every day, so you want to find the right style for you, and your space. Look through their pieces and find two artworks to reference for different reasons. For example, you might like one for colour and one for subject matter. Be thorough in your research here, look through their website and socials to get a broad view of their work. Secondly, size matters! You will need to be really specific on the finished size. Look at where you might want to hang your artwork. Create a mock artwork by taping the pages of a newspaper together to make a large piece. Always start large and slowly reduce the size until you are happy with it. Leave it on the wall for a day or two, reducing or adding to size until you are satisfied. This is the exact measurement you can now give the artist for a framed or unframed piece. Now it’s time to engage your artist! The fun begins. Contact them and request a custom piece. Tell them why you have chosen them as the artist as this allows them to understand what kind of piece you aspire to own. You don’t want to give too much detail or direction at this point, as you want their creativity to flow naturally. Remember, you have chosen this artist for a reason — you already love their work and in that must be trust. Give them your two reference pieces and why you chose them. You can tell them the exact size. They will love that you have done your homework as this helps them; in most cases the artists can’t visit your space and a photograph can only provide a limited perspective. You can touch on any specifics now, but remember keep it brief as to not cram their artistic thought pattern. You will now want to ask them how they work. Do they sketch up for you? Or will they commence work and come back to you later to show progress of the piece? Make sure you are comfortable with the way in which they create your piece. Do you want more or less collaboration? If you see a problem now, speak up. Time is money. Confirm the timeframe. When will you see a progress photo? (if applicable, refer to above paragraph). Or when will the piece be completed and delivered (I have been known to create mermaid tails in under a week, sometimes, even months at other times.)? You want to ensure this timeframe suits you, but you also need to be mindful not to rush the artist as it’s a creative process for them. They may do two or three versions before showing you a progress photo. They want to get it right! Be generous in your expectation as they may have a heavy workload at the time or varying intricacies in the piece you are requesting. Or neither of these, and they will knock it over in 24 hours! You may be given a range for example of two-to-four weeks from start to completion of the artwork. Rarely will you be given an exact date unless it’s a special request. Enjoy the journey of creating your commission artwork. You want something at the end of it that you can stand in front of and feel what you set out to feel. You want to look at it and be proud to know you had creative input, or at least a vision, for the piece, and it’s now hanging in your home or workplace for all to admire. 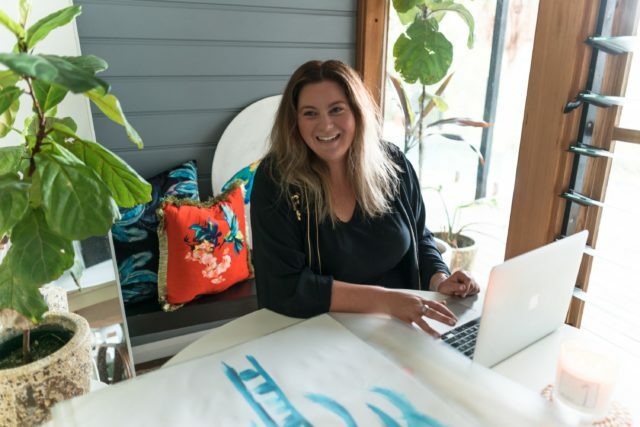 –Australian artist and designer, creates large scale artworks from her dreamy island home ‘Paradiso’ on Sydney’s Northern Beaches. A small limited edition collection is also released every few weeks online and in selected boutiques. The article on how to select an artist is really well written. I’m currently encouraging my client to do just that, so having the process specified is really helpful. Thank you. Glad it was useful, Michelle!